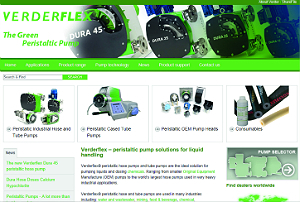 As part of the new redevelopment, the Verderflex product portfolio has been redefined (Industrial Pumps, Cased Tube Pumps and OEM pumps) to create a better fit for our markets and those of our distributors. A new inclusion to the website is the VF pump selector for the industrial pump range. The selector allows the customer to identify the pump they require according to the pressure and flow rate they are operating at. The introduction of the new tool will make the pump selection process easier, as well as allowing direct access to the product of the user’s choice. In the long term a separate pump selector for both cased tube pump and OEM pumps will also be introduced to the website.